Source: CICH graphic created using data adapted from the Conference Board of Canada, Provincial and Territorial Ranking – Environment. (2016). http://www.conferenceboard.ca/hcp/provincial/environment.aspx – accessed March 12th, 2017. 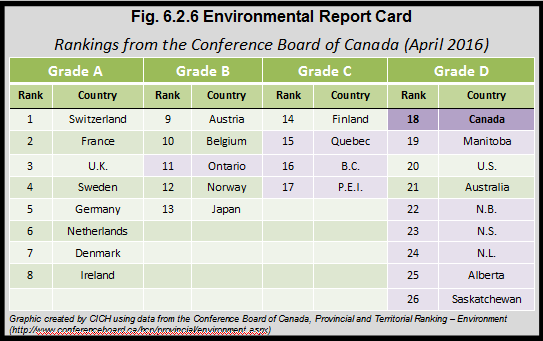 The Conference Board of Canada measures the environmental performance of Canada, its provinces, and 15 peer countries. It uses 9 indicators for the international comparisons and one additional indicator to evaluate the provinces for which there is not an international comparison. The indicators are: Nitrogen oxides emissions; sulphur oxides emissions; volatile organic compounds emissions; particulate matter emissions; waste generation; wastewater treatment; water withdrawals; GHG emissions; low-emitting electricity production; and energy intensity. The Environmental Report Card assigns Grades according to a composite of these indicators. Compared to the 15 peer countries, Canada gets a “D” overall and ranks third-last. The Conference Board reports that compared to our international peers, all of the provinces rank poorly. The top-ranked province is Ontario – who scores a “B” – but still places behind 10 of the 15 peer countries. Quebec, British Columbia, and P.E.I. score “C” and Manitoba scores “D.” Saskatchewan, Alberta, Newfoundland and Labrador, Nova Scotia, and New Brunswick are scored lowest – worse than the lowest-ranking peer country.